Advanced open water diver course is made up of 5 Scuba dives over 2 days, two compulsory dives (deep and navigation), plus three further dives of your choice. Broadens your knowledge of both the advantages and disadvantages of diving the deeper sites. This is the chance to study a larger variety of marine life and also educates on further safety issues. Will introduce you to natural navigation, allowing you to calculate distances and boat location. The options for the three further dives include a night dive (highly recommended! ), naturalist, peak performance buoyancy, search & recovery or even an under water photography dive and enriched air nitrox dive! After successfully completing the course, you'll receive the PADI advanced open water diver certification. This allows you to participate in more advanced diving activities with a maximum recommended depth limit of 30 meters/100 feet, in addition to the qualifications listed for PADI open water divers. What does this program offer you? 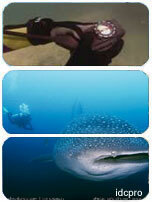 New experiences, new skills, lots of diving and thrilling adventures! So take your Scuba diving to new limits with us in Malaysia! If you're 15 or older, and a PADI Open Water Diver or equivalent, then you're ready for the advanced open water diver program. Or, if you're a PADI junior open water diver or equivalent and between the ages of 12-14, there's the PADI junior advanced open water diver program.